Oakeshott, Hayek and Schmitt are associated with a conservative reaction to the 'progressive' forces of the twentieth century. Each was an acute analyst of the juristic form of the modern state and the relationship of that form to the idea of liberty under a system of public, general law. 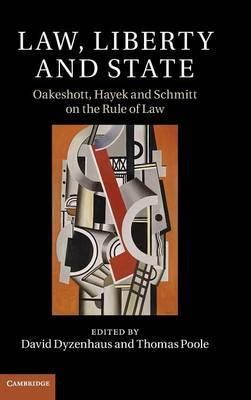 Hayek had the highest regard for Schmitt's understanding of the rule of law state despite Schmitt's hostility to it, and he owed the distinction he drew in his own work between a purpose-governed form of state and a law-governed form to Oakeshott. However, the three have until now rarely been considered together, something which will be ever more apparent as political theorists, lawyers and theorists of international relations turn to the foundational texts of twentieth-century thought at a time when debate about liberal democratic theory might appear to have run out of steam.